Today’s a housekeeping day. The dishes are in the dishwasher, there are clothes in the dryer, and we’re collecting estimates to replace our fence. 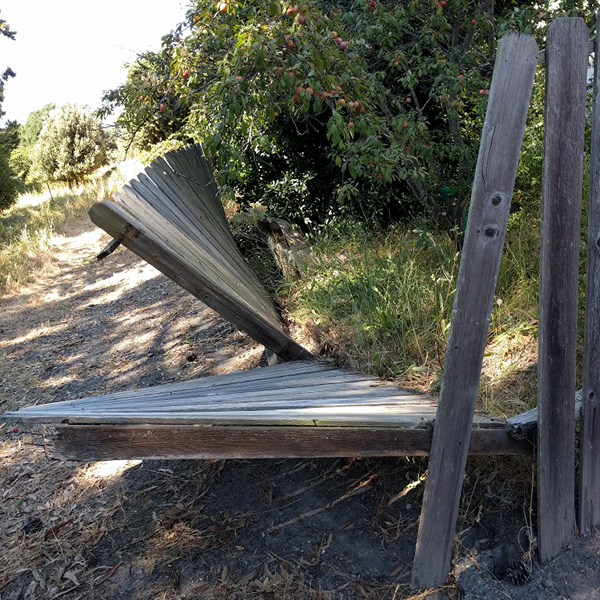 So, that being the case, I might as well do a little electronic housekeeping and clear out the pile of stuff that’s been piling up because they’re not even long enough for a Short Attention Span Theater post. 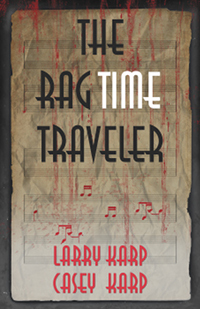 On Sunday, I’ll be at Borderlands Books in San Francisco, pushing The RagTime Traveler. The plan is to cover the history of ragtime music and the history of TRTT before I sign copies. That’s darn ambitious for an hour, so if you’re into train wrecks, come watch this one develop! I’ve griped about greengrocers’ apostrophes before (customer’s what? ), so I’ll just note that this is the first time I’ve seen single quotes used instead of double for those darn useless quotes. 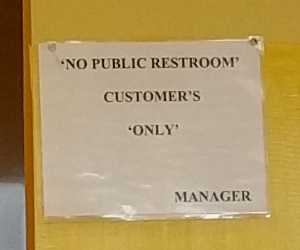 But why didn’t they put quotes around “customer’s” and “manager”? In the “you only had one job” category. 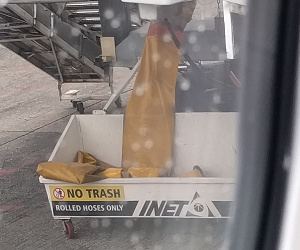 If that qualifies as a rolled hose, I really want to look inside the bin and see how many scraps of paper, broken tools, and rotting vegetables qualify as not trash. Back to grammar. The way I read this, it’s perfectly fine for me to play with the condiments for sanitation purposes. My kids will just have to watch. 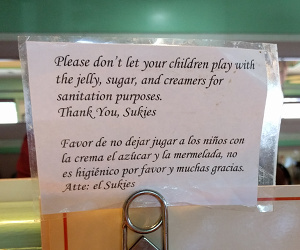 Or I can let them play with the condiments as long as it has nothing to do with sanitation. Hey, kids, how high can you stack the creamers? No, Billy, you can’t clean the spilled jelly off that container; that would be sanitary! Lawyers have a strange view of what is necessary and appropriate. Case in point: a few years ago, our local hospital closed. That’s a whole rant of its own, so I’ll spare you for now. But unwinding its affairs has been a protracted affair. Earlier this week, both Maggie and I got letters from a law firm representing our county healthcare district informing us that the hospital’s patient records will be destroyed in a few months. Frankly, that seems like a good idea to me, especially since they’re providing a way for former patients to claim their records if they need them for their new doctors. They consider it appropriate to send these letters to insurers who might have had clients who were treated at the hospital. OK, so there are no names on the letter; it’s not a privacy violation. But where the heck did they get the names of those companies “believed” to have served former patients? If they were listed in the hospital records, shouldn’t they be considered “known” rather than “believed”? Or did they just send one to every insurance company they could find a name and address for? The real kicker for me, though, is that this law firm apparently believes there’s a one in four chance that I’m the state attorney general. Really, guys, it wouldn’t have cost that much more to send a separate letter to the AG? Heck, the savings in ink from not printing Item Four on those millions of letters would more than outweigh the cost of some clerk’s time. This entry was posted in Books & Writing and tagged Apostrophe, book signings, grammar, The RagTime Traveler, You Only Had One Job. Bookmark the permalink. Oops. Absentmindedly scheduled it for 12:01 as usual, forgetting that since I wrote it today instead of yesterday, that meant noon, not midnight. Posted now. And yes, Rufus is present. But please don’t count on me to tell you what day of the week it is. Most days I’m lucky to remember if it’s a week, much less a day.